Full colour page advertisement in the program. Artwork to be supplied by the Sponsor. Can display Corporate Banner in auditorium for the entirety of the session. e.g. Piano, Strings. Name in the official program on the Sponsor Page. Name announced at the beginning, during and end of specific item sponsored. Name or Website address displayed on SCJE website for 12 months. Complementary Eisteddfod Pass to all sessions. Logo on Large Ensemble Program Page. Sponsorship must be received by 27th March 2019. High resolution – JPEG or PDF format only. Keep in mind the program is in A5 portrait orientation. Advertisement must be received by 27 March 2019. 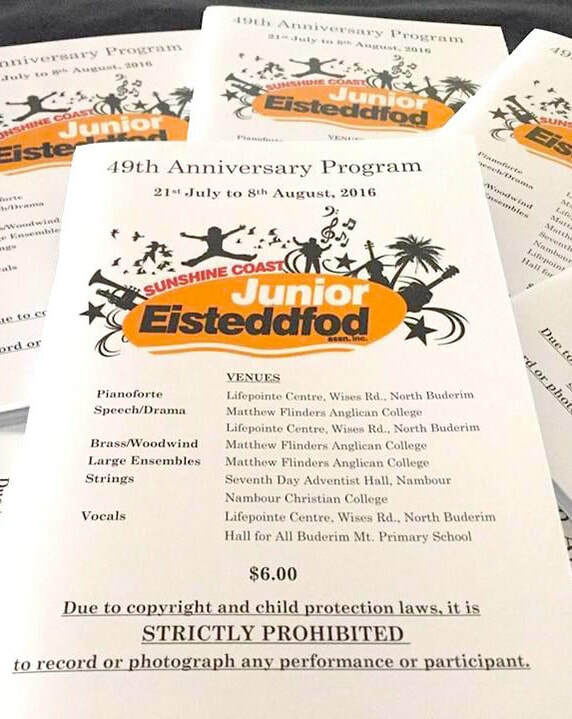 Sunshine Coast Junior Eisteddfod is a non-profit organisation and relies totally on voluntary effort. Our volunteers work in an atmosphere of friendly teamwork. Most volunteers like to work on sessions in which they have a personal interest and where they can meet people with similar interests. As far as possible, tasks are allocated to suit the individual's skills and preferences and the hours they are willing to commit. If you would like to join our team just let us know! Ushers - Take tickets at the door. Scribes - Act as the adjudicator's assistant, allowing the adjudicator to focus on the performance rather than the paperwork (most adjudicators prefer to dictate their notes). Marshals - Work backstage, organising competitors before their performances. Morning and Afternoon Tea - Provide and serve refreshments to the adjudicator and volunteers.